How To Email The Hiring Manager – And Get A Response! Do you want your job application to stand our? Here’s a quick tip: email the hiring manager… now! 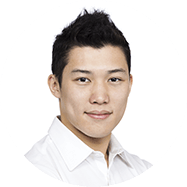 I’ve recently started recommending to my clients NOT to apply for openings on Singapore job portals such as Jobstreet, ST Jobs, Jobscentral, and the likes. It’s where EVERYONE applies to. How do you think are they gonna get noticed? Look at this screenshot from JobsBank. It’s going to be IMPOSSIBLE to standout from 142 other applicants. Applying to an opening on a job board is a waste of time. Please don’t get me wrong, you still need to login to those portals and scout around. After all, you need to know which companies are hiring. However, once you identify those open positions and companies, you need to take different approach. Applying to the position on the job portal won’t work. You need to go directly to the hiring manager. Read on and I’ll share how to email the hiring manager and get an instant reply! My team and I tried out a different strategy with a few of our clients. We told them to get on linkedin, find the hiring manager, and send him / her an email, asking for a coffee appointment. Together with a client of our’s, we crafted a beautifully worded email, complete with deadlines, bold headers, and a clear CTA (call-to-action) requesting the hiring manager to meet for a coffee. We spent hours crafting this email. 0 RESPONSES from 8 emails to 8 different hiring managers. And mind you, these were positions our client was highly qualified for. When 1 person doesn’t respond, I just assume they’re busy or are having a bad day. When all 8 don’t respond, we know our strategy is wrong. So I went back to the drawing board, and a week later, we sent an email that had just 1 line. My jaw dropped when Sarah updated me on the results. 7 out of 8 Hiring Managers responded to our one-liner email. That’s 7/8 people! And when we then sent that same long email detailing Sarah’s accomplishments and background, all 7 hiring managers responded and agreed to grab coffee. Grabbing coffee with the hiring manger prior to the interview is the shrewdest career move you can make. Why? You’ll develop a relationship with the hiring manager. They’ll know you so much better compared to other jobseekers. If you ask the right questions, the coffee meeting will almost certainly lead to a call to the final interview round, bypassing the HR department and all those other job seekers who applied through the various job portals. When you do eventually walk into the interview room, everyone will know you. They’ll be smiling. The interview will just be a formality. It all starts with that one-line email to the hiring manager to get that coffee. So, what did we say in that email? It’s a little trick I read about in Robert Cialdini’s book, Influence. It’s called the Foot In The Door Technique. The gist of it is this: when asking for a large favour, don’t be upfront about it. Hey, I need some feedback on my report. Can I send it to you? Almost everyone will say yes to a message like that. It seem’s like an easy ask. Only when your colleague has committed to helping you, do you send over that mammoth 600 word email. Since they’ve already promised to help you out, they’ll be far more obliged to return that email with some great feedback. So in summary – Ask a small favour first, get them to commit, then ask the big favour. It’s the exact same technique we’ve used here with Sarah. Offering career advice to random strangers, like Sarah, is a big ask. Most senior executives are swamped for time. Heck, I’m not even that senior and I struggle to balance my schedule daily! If a senior executive senses your request is going to take a long time, it’s likely they’ll refuse or more commonly, just ignore your email. Our original email with Sarah was far too long. It was the classic example of asking for too much, too early. My name is Sarah, formerly an Investment Associate at XXXXX in London. I’m interested in the XXXX position open at your firm. Could we have a quick call to discuss 3 questions I have? If you’re not available for a phone call, I can send over my questions via email. 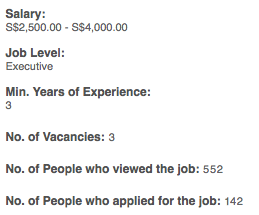 That email above received 7 out of 8 positive responses from hiring managers at large investment banks in Singapore. Some elected for a phone call, others preferred conversing via email. 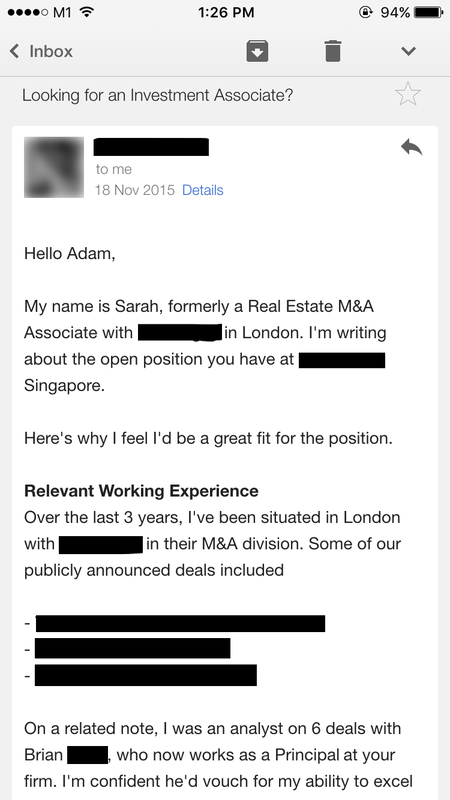 Either-ways, Sarah got in touch with 7 senior executives all from cold emailing them in Singapore. It’s a fantastic achievement when you consider that Sarah isn’t even from Singapore and barely knew anyone here who could help her. This outreach she did could haven been done by anyone. Here at ResumeWriter.SG, we strive to help our jobseekers get JOBS! While we started out as CV writers, we’ve come to realise that a great CV is just one part of the job hunting process. There are dozens of other job hunting strategies, best practices and hacks every jobseeker should know. For this reason, our CV writing packages include eBooks on interview techniques, 25 email scripts for jobseekers, advice on corporate photographs and tons of great content on perfecting that job search process. We’re not just CV Writers, we’re your partners in getting you that dream job.